Whilst researching for my forthcoming book, Life in the Georgian Court, the newspaper archives of the long 18th century have thrown up some wonderful surprises. One of my favourite is this outraged letter from the mysterious GB, printed in The Morning Post on 28th March 1808. Its tale of a princess almost embarrassed by naked soldiers is a wonderful glimpse into the ribald world of the Georgians but I shall refrain from any jokes about a general and his privates. 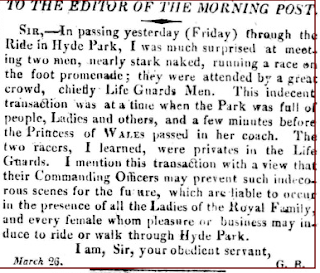 Sir, - In passing yesterday (Friday) through the Ride in Hyde Park, I was much surprised at meeting two men, nearly stark naked, running an arc on the foot promenade; they were attended by a great crowd, chiefly Life Guards Men. This indecent transaction was at a time when the Park was full of people, Ladies and others, and a few minutes before the Princess of Wales passed in her coach. The two racers, I learned, were privates in the Life Guards. I mention this transaction with a view that their Commanding Officers may prevent such indecorous scenes for the future, which are liable to occur in the presence of all the Ladies of the Royal Family, and every female whom pleasure or business my induce to ride or walk through Hyde Park. 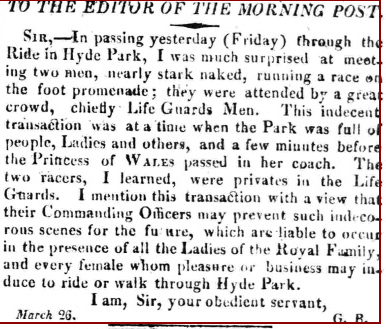 Caroline, Princess of Wales was thankfully spared the sight of the Life Guards in their unmentionables but as GB sagely notes, she is not the only lady who might want to pass through Hyde Park without encountering near-naked soldiers. Everything I have read about Charlotte leads me to believe she would have thought it hilarious and would have demanded to be allowed to watch. She would probably have sent a gift to the winner. I agree with Bev! One does wonder, however how 'nearly naked' they really were, and how easily 'Offended from Stoke Newington' [aka G.B.] was shocked. After all, I grew up with Mary Whitehouse making a hoohah all the time about things nobody else could see any problem with [and my grandmother-in-law-to-be went out and bought Chuck Berry's 'My Dingaling' just because the Hairy White Mouse had castigated it.] I suspect that far from being in Unmentionables, the young men were stripped to the waist for their run. Charlotte's mother was Princess of Wales. I don't think Charlotte was . I do agree that the soldiers were probably shirtless unless emulating ancient Greeks. I don't think she would have minded one jot! I remember Mary W, what a pain she was! 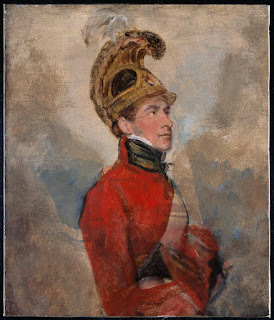 Caroline Princess of Wales was said to be appreciative of the manly form-- as who isn't? I think the ladies would have enjoyed the sight of the race. The male complainer was just jealous that his form wasn't as pleasing. For some reason live men doing things with their shirts off is more appealing than those book covers with them half naked. Funny, the men racing were probably wearing as many clothes ( and perhaps more) as the ones on book coves that are now on view even for little children. Horrors!!!! Also, though one still hears about the Regent and his daughter, his wife Caroline, The Princess of Wales is mentioned much less often. The Prince married her while enamoured of two others, didn't even make the choice himself( he as much as flipped a coin) ; took his mistress with him on his honeymoon, and tried to rid himself of his wife a couple of times ( legally) . The divorce action was as nasty as they often are but failed because there was no way he was coming to the court with clean hands. Also, despite the case where the woman was said to have borne twins at 48, the Lords weren't eager to grant divorces where the wife was at an age when spurious offspring would ne a problem. Caroline Queen of England was barred from the coronation and died a year later. It is as if everyone wants to hide her under the bed or in the closet. There are a couple of books about her, Jane Austen mentions her, but she is largely forgotten otherwise. Some histories of the period barely mention her. 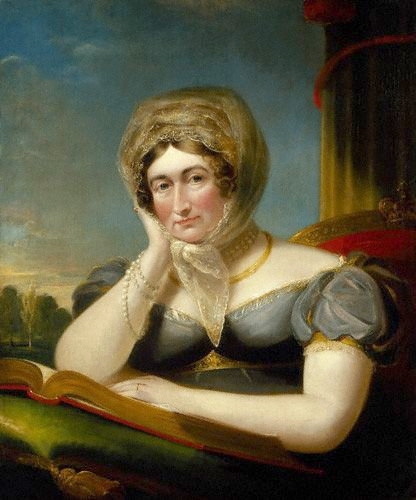 Caroline features very heavily in my forthcoming book, from her marriage to her death. She lived a fascinating life and really is little remembered! I agree with Sarah. The minute I started reading the news report, I thought those guards were likely stripped to the waist to keep their shirts from getting all sweaty...thus, half-naked. I would think them rather impressive had I been living back then. I suspect the princess would agree! I feel like Hyde Park should uphold this grand tradition. An annual half naked "indecent transaction"? As the commanding officer of the two Life Guards involved in Friday’s race in Hyde Park, I write to protest with the utmost vigour at the supposed indecorousness of my men. I resent the imputation, Sir – I resent it most strongly. Is your correspondent not aware that Napoleon is even now poised across the Channel, a threat to make all right-thinking Englishman desire nothing more than to train their bodies to the highest attainable peak of physical perfection in order to resist the madding foe? The sight of two strapping young gentleman with the wind blowing through their hair, their manly limbs shining with perspiration in the fine spirit of English competitiveness, taught muscles rippling like whipcord as they push themselves to that limit of British endurance which far exceeds that of inferior nations; – that, Sir, I say is as fine a sight as anything in Hyde Park has to offer. As for the ladies, I suggest the importation of street-sellers with sal volatile arranged at strategic points around the Park.